Jörg Lotze from Xcelerit has posted results from what may be the first published benchmark of the Nvidia Kepler K20 GPU on real-world financial applications. His team measured the computation times for the Monte-Carlo LIBOR swaption portfolio pricer on one GPU of each system, pricing a portfolio of 15 swaptions over 80 time steps and using varying numbers of Monte-Carlo paths. 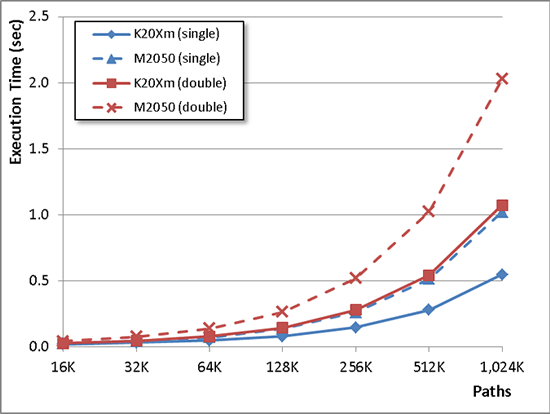 It is apparent that NVIDIA’s new Tesla K20Xm GPU gives a huge performance improvement for real-world applications – up to 1.9x in this example (very close to the theoretical peak: 2x). It can also be seen that the improvement for double precision is better than for single precision – something financial institutions will be pleased to hear.